The space is always safe when you have yourself on your side. When you don't apologize for being who you are or for what you've done and experienced in your life. When you stand confidently and lovingly exactly where you are right now, no regrets or defensiveness. The question about whether or not I'd lost someone close me, or the one about what happened with my last relationship. Not many people know that those questions are one and the same, and that having to answer them has been one of the most challenging experiences of my life. When you ask me those questions, you're asking me to share my greatest loss and tell you about an experience that completely shifted me to my core in a moment. You're asking me to open a part of my heart that is the most tender and raw and unfiltered. Basically, you're asking a whole lot more than you realize... and that's made me a little unsteady at times, as I'm often uncertain how to respond. Because, as you probably know, when we put ourselves out there in a real way, we risk getting rejected, ridiculed, or hurt. We risk being told there's something wrong with us, or that we're making other people uncomfortable. We risk feeling isolated and alone in a way that leaves us shattered. "Don't be afraid, the space is always safe." Even when they don't ask questions that let you know they're actually interested in what you have to say. Even when they don't seem capable of holding space for the intensity of your range of emotions. Even when the story is uncomfortable and the pain is still fresh. The space is always safe when you hold it fully for yourself. I've learned from answering these questions honestly and working through my grief, you really do learn who's willing to walk alongside you and hold your hand through the worst of it all when you show up truthfully. And sometimes people aren't willing to do that. They're not able or capable of holding that space for you. Or maybe they just don't want to. And that's okay... because YOU are. 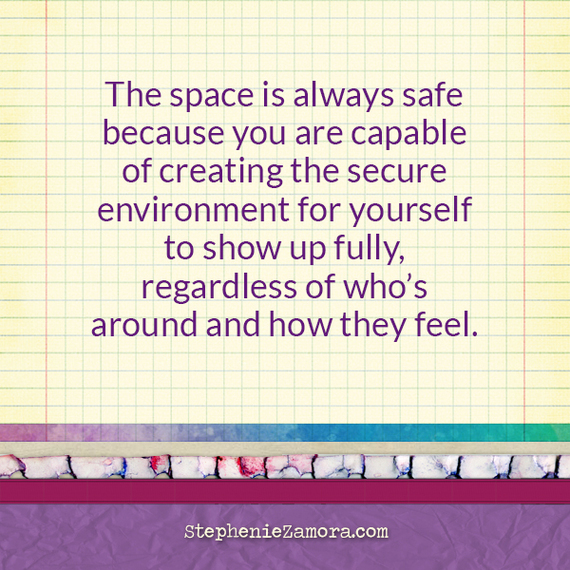 You are capable of creating a safe space for yourself to show up fully, regardless of who's around and how they feel. Does that mean it's easy? No, but it's possible. The space is always safe when you have yourself on your side. When you don't apologize for being who you are or for what you've done and experienced in your life. When you stand confidently and lovingly exactly where you are right now, no regrets or defensiveness. When you know that you're whole and beautiful and complete even if the other person can't (or won't) stand alongside you and hold your hand as you walk forward. We often put too much pressure and expectation on other people to make the space safe for us... but truth is, the space is always safe because you always have yourself. And while sometimes we can be our own worst enemies, we have the ability to be our own best friend, number one fan, and cheerleader... and that's a choice we should all make sooner rather than later. I've been through some hard experiences and I've made some really bad choices in my life. I've done things I'm not proud of, and things that make me look like a total fool. But I choose to hold a safe space for myself and own every part of who I am and where I've been... because life is better when we have ourselves on our side. And I'm learning that the more we own and love and hold space for the person we are in each moment, the more able and willing the people around us are. With over a decade of experience in design, development, and brand/marketing strategy, she's currently helping coaches, solopreneuers, and small businesses create their beautifully branded online presence, without breaking the bank, through her highly regarded Jumpstart Website Design Package. Stephenie's been featured in The Huffington Post, Yahoo Shine, Positively Positive, and Brian Tracy International. Learn more at www.StephenieZamora.com!